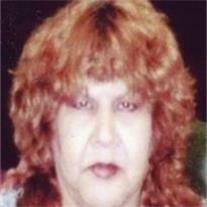 Herlinda Guebara Parra, 60, passed away November 12, 2011 in Scottsdale, Arizona. She was preceded in death by her parents, Luis and Josepha Guebara, her brothers, Juan and Danny Guebara, and her sisters, Rosa Vega and Juana Riggs. Linda is survived by her husband, Manuel Savala Parra, and her children, Teresa A. Hill, Lorraine Parra, Gabriel Parra, and Jesse Parra. She is also survived by her 7 grandchildren, Paul Parra, Jenica Perez, Faith Gould, Ashley Goodpaster, Joshua Hill, Nicholas Hill, and Alexander Jacob Leyva and 1 great-grandchild, Kellianne Parra. Linda is also survived by her brothers, Richard Guebara, Ramiro Guebara, and Joe Hernandez, and her sisters, Lydia Cavazos, Elisa Garcia, Irene Van Wambeck, Elsa Munguia, Rachel Rubio, Rebekah Plama and Mary Venegas. A visitation will be held Monday, November 21, 2011 from 6-8 PM at Bunker’s Garden Chapel, 33 N. Centennial Way, Mesa, AZ. Funeral services will be on Tuesday, November 22, 2011 at 10 AM at Bunker’s Garden Chapel.